A Purple Preschool Theme: Ideas & Activities with the Color Purple! Devoting one day or several days to just one color at a time is a fun way to help preschoolers learn their colors. Before you begin your purple theme, send a letter home with your students inviting them to wear their favorite purple clothes on one of the days you will be studying the color. Here are few fun songs and poems to share with your students. The color purple, the color purple? We love purple, we love purple. Yes, we do. Yes, we do. Just for me, just for you. This is a fun way to expose the children to some things that are purple and to practice their speaking skills. Ask each child to look around their houses and bring one item to school that is purple. Display all of the items on a table in the classroom for the children to look at. Each day let a few children show their items to the class and tell a little about it. Mix together 1 cup of cornstarch, 1 cup of water and a few drops of blue and red food coloring to make purple goop for your sensory table. Add red and blue food coloring to the water in your sensory table to change the color. String different numbers of purple beads onto pieces of yarn. Then make cards with the numbers written on them. Put the beads and the cards at a center. Have the children count the beads and match them to the correct card. Cut circles, squares and triangle out of purple paper or card stock. Place them at a center for the children to practice sorting by shape. You can also cut the shapes out of light and dark purple and have the children sort them by color too. Bring in different types of purple fruit, like plums, grapes and blackberries to taste for snack one day. Then let them vote on their favorites and make a simple picture graph to show which fruit the class liked most. Give each child a zip lock bag with a squirt of shaving cream inside. Then go around and add a few drops of red and a few drops of blue food coloring. Close the bags and have the children squeeze them gently to mix the colors together until the shaving cream turns purple. Then they can squeeze the purple shaving cream onto their tables and draw with it. Fill a clear jar or vase about halfway with water. Then add red and blue food coloring to turn the water purple. Place a white carnation in the jar. The children can watch over the next couple of days as the petals begin to turn purple. It's a fun lesson on plants, too! Set up an easel with white paper and provide the paint brushes and paint in different shades of purple to paint with. Mix a packet of grape Kool-Aid into some purple paint. Then give the children a picture of grapes to paint. When the paint dries, the grapes will smell like grapes. Give the children purple pieces of construction paper, glue and scissors. Have them search through magazines and weekly grocery store ads to find pictures of things that are purple. They can cut out the pictures and glue them onto the paper to make a purple collage. 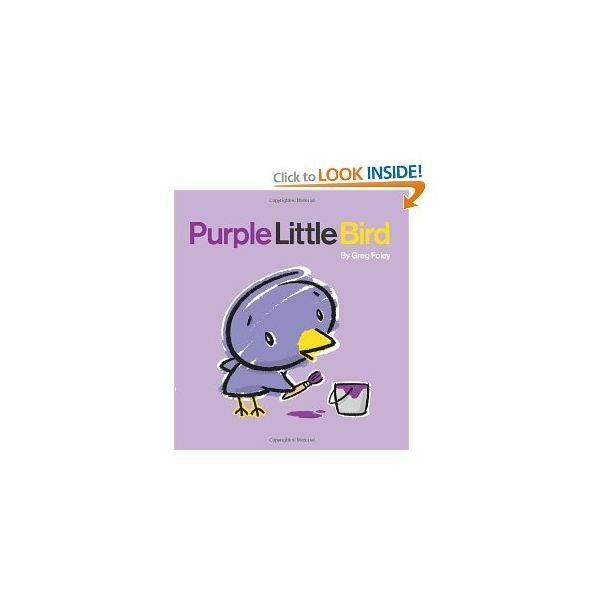 Purple Little Bird has a purple house and a purple garden, but he can't quite make his purple world perfect, so he sets out to find a perfect place to live. He meets animals of all colors on his journey and soon finds that his perfect place is his own purple little house. This is a cute story that preschoolers will love. Lily has a new purple purse that plays music and new movie star sunglasses that she can't wait to show to her friends at school. Unfortunately, her teacher tells her that it isn't time yet, but she just can't resist and her new treasures are taken away. Young children will be able to relate to Lily's impulsive actions and be thrilled when all is well in Lily's class again. Harold creates his own magical journey with his purple crayon. After you read it, give each child a purple crayon and let him draw where he would like to go on an adventure. Sally is a duck who orders some purple socks. When they arrive she finds that they are too small, but the enclosed note says that they will grow to be the right size. They do grow, but then they keep right on growing bigger and bigger. What will Sally do with her enormous socks? These activities will make your purple preschool theme a success!